Moberly involves an integrated mining and processing operation. 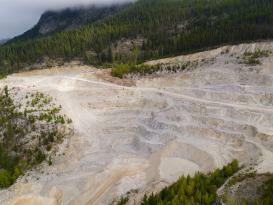 The Moberly deposit is a large-scale and high-grade quartzite silica ore body located on the slopes of Mount Moberly, approximately 7km due north of Golden. The deposit is uniquely high-grade with an average grade SiO2 content of 99.7%. Currently, identified resources are capable of supporting a mine life of approximately 35 years. The deposit also exhibits strong exploration upside. Mined material is transported 16km to a newly constructed processing plant and load-out facility. The Moberly plant site lies on freehold land adjacent to the Trans-Canada Highway and Canadian Pacific Railroad including a dedicated rail siding. This location allows Northern Silica to provide its customers with logistics flexibility for timely delivery to a variety of locations. In particular, Moberly is capable of efficiently serving customers in the Western Canadian Sedimentary Basin. The new Moberly processing facility is capable of producing approximately 300,000 tonnes per annum of premium frac sand as well as a range of other high-grade silica products. Moberly offers strong expansion potential with plans for a multi-stage expansion currently being evaluated. Northern Silica is committed to protecting the health and safety of its employees and contractors. We are building a culture of safety and operational excellence to achieve our objective of Zero Harm. All our employees and contractors undergo regular safety briefings and training programs. We are dedicated to minimizing environmental impacts associated with our operations. We will comply with all Canadian legislation and regulations, as well as appropriate international standards. Responsibility for environmental stewardship rests at the highest level of Northern Silica. We seek to ensure continuous improvement in the management of environmental resources, as well as create environmental awareness within Northern Silica employees and contractors through regular training. Monitoring programs are reviewed on a regular basis and adjusted according to changing needs and best practice. Moberly has its own rail siding off the Canadian Pacific East West main line and is located adjacent to the Trans-Canada highway near Golden, BC, providing customers with logistical flexibility for delivery. Martin is a Director at Taurus Funds Management Pty Limited and is based in Sydney. He holds a Bachelor of Business (Economics & Finance) and a Masters of Mining Engineering. Prior to joining Taurus in 2014, Martin worked in investment Banking including with Barclays Capital and ABN Amro Bank. Reid is the President and CEO of Northern Silica Corporation. Over his 40-year career, Reid has also served as an officer and director of numerous corporations, the securities of which have been listed for trading on the Toronto Stock Exchange, the New York Stock Exchange and the Australian Stock Exchange. In these various positions, Reid has had direct experience and responsibility for making decisions regarding executive compensation matters and the suitability of the Corporation’s compensation policies and practices as well as the overall Corporate Governance responsibilities. Reid was previously a director of Heemskirk Canada. Bill is a recently retired British Columbia Mines Minister with 16 years’ experience as an MLA and Minister plus two decades of private sector experience in business and law. He holds a Bachelor of Arts degree (English) and Law degree from Queens University. Bill lives in Cranbrook, B.C. Cullen is a Professional Engineer with over 15 years of experience holding a bachelor’s degree in Metals and Materials Engineering from the University of British Columbia. 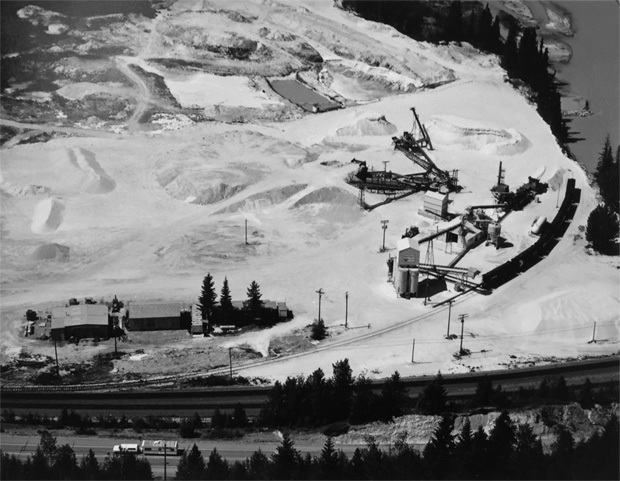 Prior to joining Northern Silica, Cullen held both technical and Management roles within the Sand and Gravel Mining Sector. Cullen has significant operational experience having managed several Lehigh Hanson Materials Limited’s Flagship North American operations. Moberly silica mining and processing operations were initially established at the current location in 1981 by Mountain Minerals Limited. Since that time mining and processing methods have remained relatively unchanged. Tonnages quarried and processed have varied between 80,000 and 300,000tpa. Initial operations focussed on the production of silica sand, principally for supply to a former Owens Illinois glass bottle manufacturing plant at Lavington, British Columbia. Owing to Moberly’s uniquely high SiO2 content Mountain Minerals was a key supplier to Owens Illinois until the Lavington plant was closed in 2008. Other historical applications of Moberly silica have included silica flour (used predominantly in high-quality thermal cements), golf course sand, decorative stone, traffic paint and other industrial applications. Initial test work on the suitability of Moberly silica as a frac sand commenced in 2010. This test work demonstrated the ability to produce a premium quality frac sand for supply to the Western Canadian Sedimentary Basin. Following a phase of detailed design, works commenced on a new processing plant at Moberly in 2015. Production from the redeveloped Moberly Silica Mine commenced in September 2017.